I’ve already written about my love of breakfast in my post on granola so it’s clearly high time for another breakfast-related post. 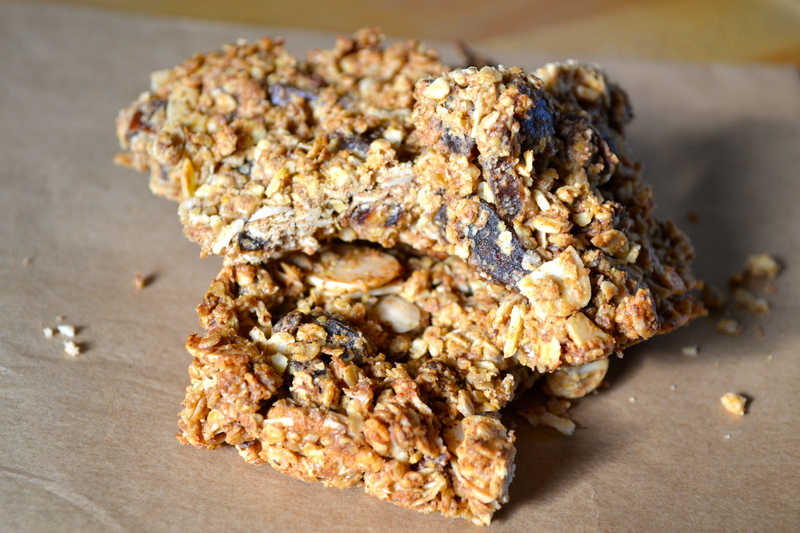 And what better topic than breakfast granola bars? The perfect on-the-go breakfast option for those busy mornings when you don’t have time for a proper breakfast. Ok, who am I kidding. I’m such a breakfast freak that I get up early just to make sure I have time for my bowl of cereal. Not so for the Perky Kebab though, and I’m always hungry again by 11am and in need of a snack, which makes these bars perfect. So I made a batch of the Smitten Kitchen’s Almond Date Breakfast Bars over the weekend and what a revelation! 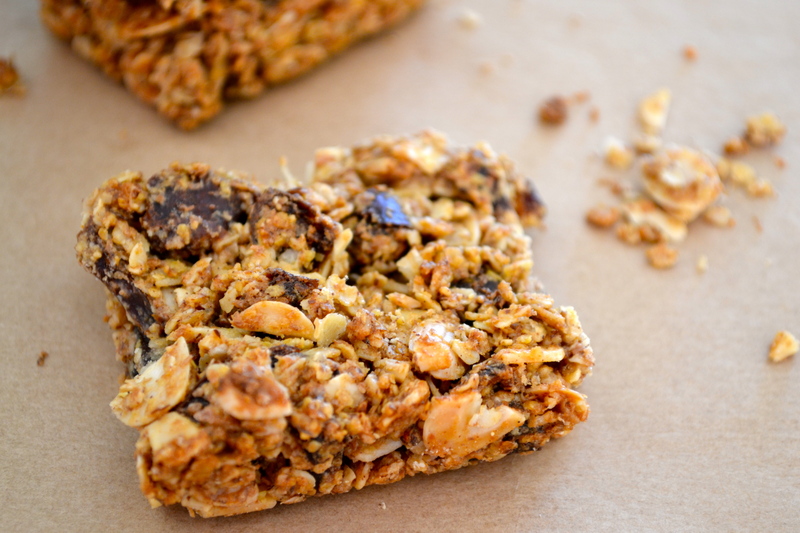 Breakfast bars are usually jam-packed full of sugar and oil – well, at least the versions you buy from the supermarket – and, let’s be honest, taste all the better for it. But these are pretty healthy and still taste incredibly yummy. And that’s probably thanks to the copious volumes of almonds, almond butter (which has got to be more healthy than regular butter surely?? ), and little nuggets of sweetness from the dates. I’m a huge fan. So much so that I may take to breakfast on the run just to ensure I get to eat more of these! 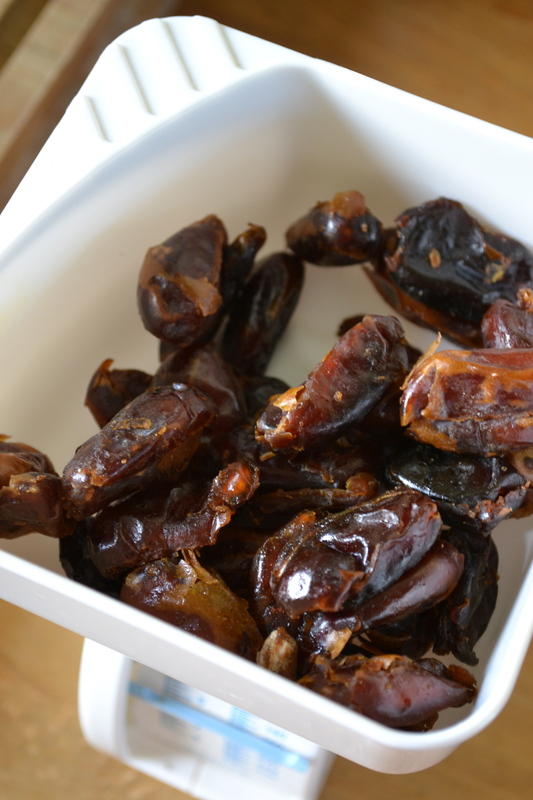 I’m already plotting for the next batch – replacing the dates with dried cherries to get a cherry and almond version which I think may even top the last batch. Yum. 1. Preheat the oven to 180°c/160°c fan. Line a 20x20cm square cake tin with 2 strips of baking parchment, letting the strips run up each side of the tin so you can easily remove the bars from the tin once they are cooked. 2. Stir together the dates, oats, flour, wheat germ, almonds, salt, orange zest and cinnamon in a large bowl. 3. In a separate bowl, stir together the almond butter, olive oil, honey and almond extract until smooth. 4. Pour the wet ingredients into the dry ingredients, stirring well to ensure everything is evenly coated. 5. Spread the mix into your cake tin, pressing into the sides and corners well, and smoothing the top. 6. Bake in the oven for 20-25 minutes. The bars will still seem soft when you remove them but will firm up as they cool. The best thing is to leave to cool in the tin and then put in the fridge for 30 minutes before cutting into squares. This reduces the risk of breakage!